Reaching back into their motorsport history to usher in the modern era of Porsches powered by flat-four cylinder engines, Porsche has officially announced the 718 series Boxster and Boxster S. The badge is a nod to the company’s mid-engined racecar from the 1950s and 60s, which competed in everything from European hill climb events to the 24 Hours of Le Mans. 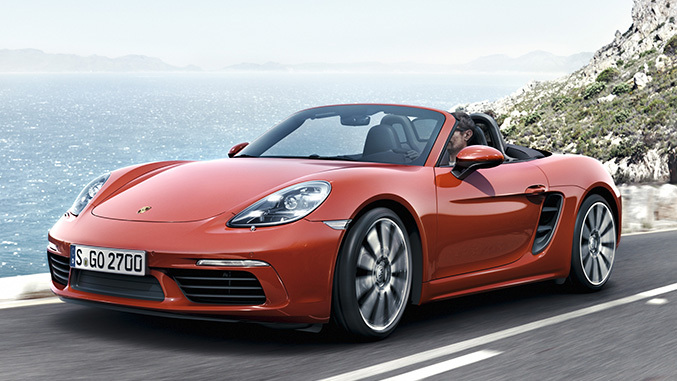 While displacement and cylinder count are down from the outgoing car, power is up substantially in both the Boxster and Boxster S. The standard Boxster will receive a 2.0-liter, turbocharged flat-four making 300 horsepower, while the Boxster S gets a 2.5-liter flat-four with a variable-geometry turbocharger, a combination good for 350 horsepower. It results in substantial gains for both models, giving the standard Boxster 35 more horsepower and 74 pound-feet of additional torque, while the S variant also gets a 35 hp bump to go along with an extra 43 lb-ft. These turbocharged mills also offer a wider torque range than their predecessors, with the 2.0-liter generating 280 lb-ft from 1,950 to 4,500 RPM and the 2.5-liter making 309 lb-ft across the same rev range. Acceleration times for both models see huge improvement with the newfound power, as the standard Boxster now sprints to 60 mph from rest in 4.5 seconds – a 0.7 second improvement – while the S does the deed in four seconds flat, shaving half a second off the time posted by the outgoing Boxster S.
A six-speed manual gearbox will be outfitted as standard on both the Boxster and Boxster, while the dual-clutch PDK automatic will be optional on both models. Porsche Active Suspension Management will also grace the option sheet for both models, which will lower the car by 0.4 inches and add active dampers to the mix. Visually, the 718 Boxster gets a slightly more aggressive look to complement the new performance, with deeper side intakes and optional four-element LED daytime running lights. The new drop-top will also offer the latest iteration of the Porsche Communication Management touchscreen infotainment system as standard on all models. The 718 Boxster will land in US showrooms in June for about $57,000 for the standard Boxster and $69,500 for the S model with destination. Check out the press release below for additional details. 20 years after the first Boxster made its debut, Porsche is restructuring its mid-engine roadsters. The designation for the new generation of models is 718 Boxster and 718 Boxster S.
The two-seat convertibles are now more powerful yet more fuel efficient. With them, Porsche continues the tradition of the four-cylinder flat engines that were used in the Porsche 718 mid-engine sports cars that won numerous races back in the 1950s and 1960s, among them being the legendary Targa Florio and Le Mans. The centrepiece of the new model series is the newly developed four-cylinder flat engine with turbocharging. The 718 Boxster develops 220 kW (300 hp) of power from two litres of engine displacement, while the 718 Boxster S attains 257 kW (350 hp) from 2.5 litres of displacement. In the S-model, Porsche also uses a turbocharger with variable turbine geometry. In fact Porsche is now the only manufacturer to offer VTG technology in production cars with petrol-driven engines, both in the 911 Turbo and in the 718 Boxster S. Impressive here are the considerable power gain of 26 kW (35 hp) compared to the previous Boxster models and the efficiency of the new turbo engines. The new 718 Boxster models have fuel economy improvements of up to 13 per cent. The completely new chassis tuning and stronger brakes provide for passionate and sporty driving pleasure. The design of the new model line was also comprehensively advanced. The vehicle was completely revised except for the luggage compartment lids, the windscreen and the convertible top. Inside, a newly designed dash panel frames the cockpit. In addition, the latest generation of Porsche Communication Management (PCM) with a state-of-the-art touchscreen is included as standard. The navigation module is available as an option. The launch of the new 718 Boxster generation represents the first time since the late 1960s that Porsche is implementing sports cars with four-cylinder flat engines again since the end of the 1960s. Turbocharging significantly boosts torque. The two-litre engine of the 718 Boxster has a maximum torque of 380 Newton metres (gain of 100 Newton metres), which is available from 1,950 rpm to 4,500 rpm. The 2.5-litre engine of the 718 Boxster S even attains 420 Newton metres (60 Newton metres more) over a speed range from 1,900 rpm to 4,500 rpm. Thus, the new 718 Boxster models sprint even faster. The 718 Boxster – with PDK and the Sport Chrono Package – sprints from zero to 100 km/h in 4.7 seconds (0.8 seconds faster). The 718 Boxster S with the same equipment completes this discipline in 4.2 seconds (0.6 seconds faster). The top speed of the 718 Boxster is 275 km/h, and the 718 Boxster S has a top speed of 285 km/h. The Porsche turbo concept is boosting driving performance while improving fuel economy. In the 718 Boxster, the four-cylinder flat engine with PDK has a NEDC fuel consumption figure of 6.9 l/100 km (1.0 l/100 km less). In the 718 Boxster S, the 2.5-litre turbo flat engine with PDK consumes just 7.3 l/100 km (0.9 l/100 km less). The 718 models come with a six-speed manual transmission as standard. The Porsche Doppelkupplungsgetriebe (PDK), which now features fuel-saving virtual gears, is available as an option. The 718 model line can be made out at first glance. The front end of the new roadster exhibits a much more sculptural form. The front has a wider and more masculine appearance. The much larger cooling air intakes at the front are a distinct exterior expression of the new turbo engine concept. The front end of the 718 Boxster is rounded out by the new design of the bi-xenon headlights with integrated LED daytime running lights. LED headlights with four-point daytime running lights are available as a new option. From a side view, identifying features of the new model line include new, independently styled wings and side sills. Larger air inlet panels with two fins emphasise the car's dynamic look. The doors are now designed without door handle recess covers. New 19-inch wheels are standard on the 718 Boxster S. 20-inch diameter wheels are available as an option. The redesigned rear body of the 718 Boxster has a much wider look – especially due to the accent strip with integrated Porsche badge between the tail lights. The entirely redeveloped tail lights are distinguished by their three-dimensional LED technology and four-point brake lights. In its driving dynamics, the new roadster follows in the tracks of the original 718. The car's completely retuned chassis enhances cornering performance. The electromechanical steering system is configured to be ten per cent more direct. This makes the 718 Boxster even more agile and easier to steer, both on circuit tracks and in everyday traffic. Available at extra charge for the roadsters is Porsche Active Suspension Management (PASM) with a ten millimetre lower ride height. For the first time, the PASM sport chassis with a 20 millimetre lower ride height is available as an option for the 718 Boxster S. The active chassis, which has also been retuned, offers an even broader spread between long-distance touring comfort and dynamic sporty stiffness. As in the 911, the optional Sport Chrono Package now comprises the Individual programme in addition to the three settings Normal, Sport and Sport Plus. In sports cars with PDK, the Sport Response Button has been added, which is located at the middle of the driving programme switch. Inspired by car racing, it enables the driver to configure the responsiveness of the engine and the PDK to be very direct. 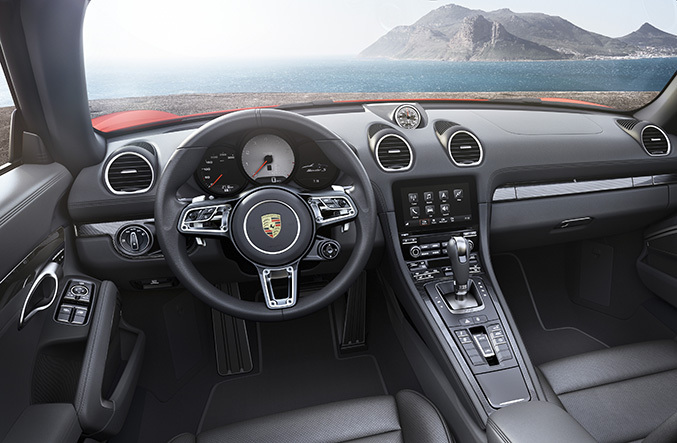 Awaiting the driver in the cockpit of the 718 Boxster is the familiar Porsche interior environment, now upgraded with new elements such as the instrument panel. Another central element of the new interior layout is the Porsche Communication Management (PCM) unit with mobile phone preparation, audio interfaces and the Sound Package Plus with 110 watts of audio power. The PCM can be extended with optional modules to thoroughly adapt it to personal requirements. For instance, the navigation module with voice control is available, which makes it easy to input driving destinations. In addition, the Connect Plus module is available as an extension of the navigation module; it provides extended online services. The market launch of the new mid-engine sports car begins on April 30 in Europe. 718 Boxster pricing starts at 53,646 euros in Germany, and the 718 Boxster S from 66,141 euros, each with country-specific features and including VAT.